Back to the wonderful world of everyday-GP-land tonight. A 19 yr old man comes to see you in surgery. He's worried about some short-lived palpitations he had in the early hours of Sunday morning. He's usually fit and well with no significant family history of IHD, or sudden unexplained death. He is on no medication. On further questioning he admits the palpitations were an isolated episode after a rather 'heavy' night of alcohol, caffeinated energy drinks, smoking. He denies any use of recreational drugs. After a thorough history and examination, you are completely happy that this was lifestyle induced, and educate him appropriately. You reassure him that no further investigations are necessary, but to call you again if problematic symptoms return. He appears to remain anxious and unconvinced, and doesn't seem to want to leave. a) Smile, stand up and open the door for him? b) Turn back to your computer and sip your coffee, waiting patiently for him to leave? OK. You are feeling benevolent, so you opt for c.
He tells you that he is in the process of applying to the RAF as he hopes to be a fighter jet pilot. He's worried that these recent symptoms may mean something more sinister, which may need 'dealing' with before he attends for his interview/medical. He asks if he could have 'a heart trace or something'. a) Agree to his request and book him for an ECG? (It goes against your clinical judgement, but if it will help reassure him - it's going to be normal after all...). Rate: Atrial (P-wave rate) and Ventricular (Q-wave rate)? QRS:normal shape? size? Duration? Consistently preceeded by a P wave? ST segments - Are they isoelectric? QT interval - is it normal duration? Q1. 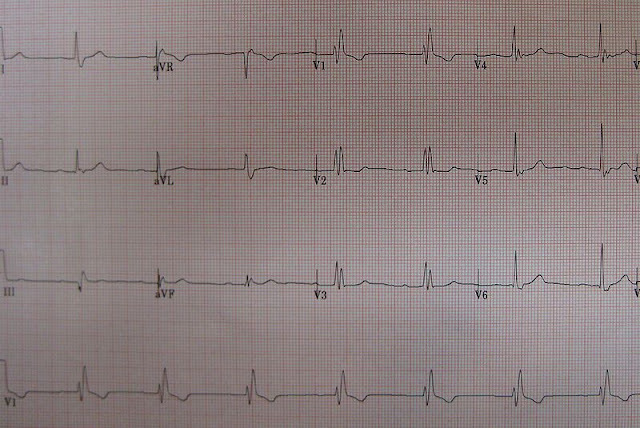 Does this man's ECG fulfil this definition for sinus rhythm? (Check the definition of sinus rhythm if you are unsure). Q2. What about the QRS - does it look normal? Is the duration normal? I would pass this as a 'normal' ECG. The rate (approx 54bpm) is a bit slow to be defined as sinus rhythm (SR = 60-100bpm) so we would have to call it a sinus bradycardia. 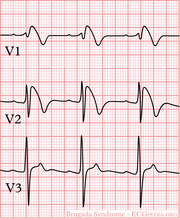 The P waves are regular and consistent, and each P wave is followed by a QRS. The PR interval is constant and normal (normal PR interval is 3-5 small squares). 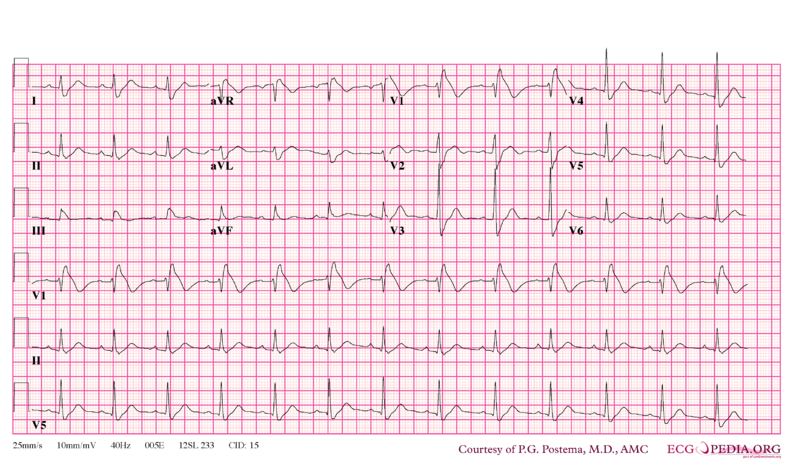 The ST segments, and QT interval, are also normal. Unfortunately it may be a bit tricky to see clearly on this digital reproduction, but there is a slight 'blip' in the QRS conduction. This is seen most clearly in the inferior leads, aVL, and perhaps V1. However, despite this, the QRS isn't broad enough to class this a Bundle Branch Block. Normal conduction through the ventricles is very fast (0.12 secs - under 3 small squares). In order to diagnose a complete Bundle Branch Block, there has to be some delay in conduction through the ventricles. ie. The QRS complex will be widened to > 0.12secs ( 3 or more small squares). Some may class this as an "incomplete" Bundle Branch Block - but even so, the rest of BBB criteria aren't really met. Nor is the QRS wide enough to qualify as a more non-specific intraventricular conduction delay. (Intraventricular conduction delay is suggested if a widened QRS is seen, but without the morphological features of LBBB or RBBB). 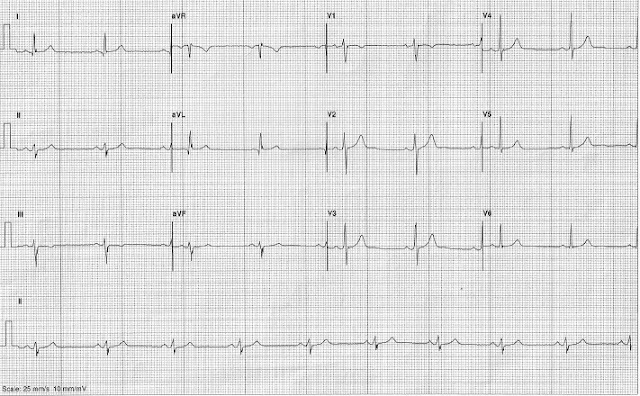 So - Coupled with his presenting symptoms, I would pass this a normal ECG in a healthy adult. I don't think any further investigations are warranted. But what will the RAF say? If their expert occupational physicians feel that this warrants further specialist investigations on occupational grounds, they will arrange the necessary. Thoughts/comments welcome please! See a great web resource ECGpedia.org Conduction Delays for a simple and clear definitions of Bundle Branch blocks - complete and incomplete - and Intraventricular conduction delays. 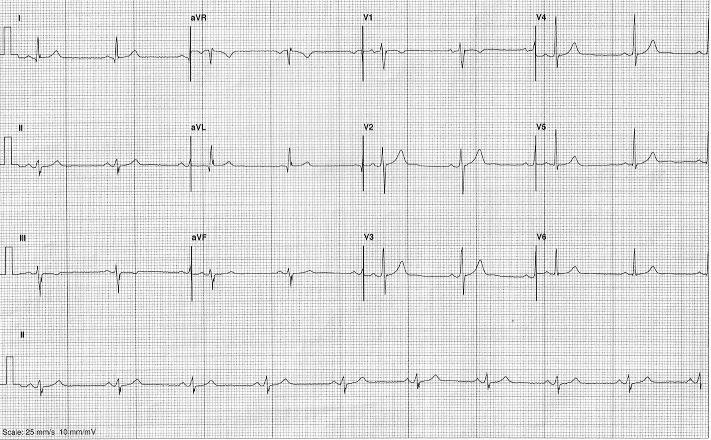 Note the morphological features of RBBB (seen RsR in V1), but the QRS complex is not quite wide enough to diagnoses RBBB (is just under 0.12 secs). 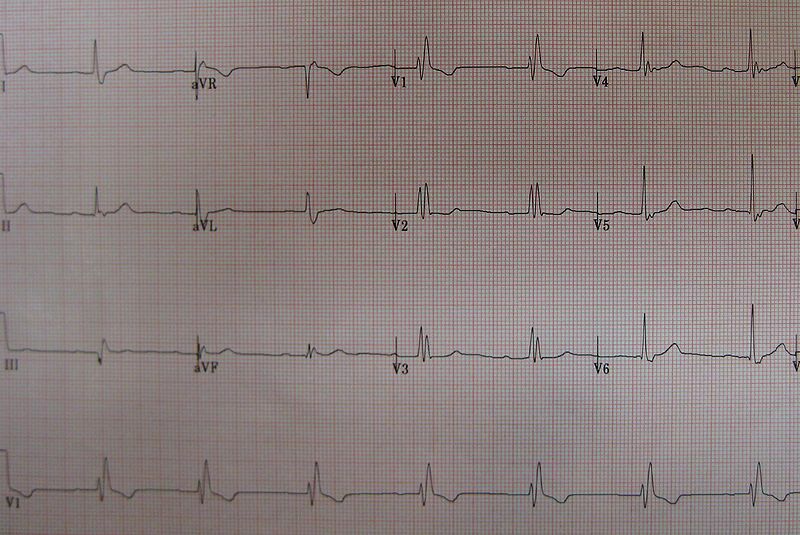 If the same man presented with this ECG and the same history - would that have altered your management? It shouldn't have. This ECG might be seen in normal healthy hearts, and clinically his symptoms sound more suggestive of benign palpitations/tachycardia, secondary to lifestyle triggers. 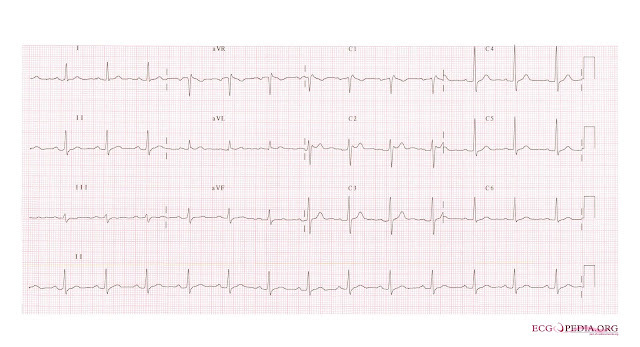 In Right and Left Bundle branch blocks, or any Intraventricular conduction delay, the QRS complex will be widened. LBBB = RsR most prominent in Leads I and V6. Usually, The R' (2nd R wave) is larger than the R (1st R defection) - giving a very distorted M shape. An incomplete RBBB may be seen in normal healthy hearts. Likewise LBBB may be a normal variant in the elderly, but should raise suspicion of other things if seen in a younger person. RBBB can be a finding normal in healthy hearts. Have the confidence of your conviction to state the ECG is within acceptable normal limits. 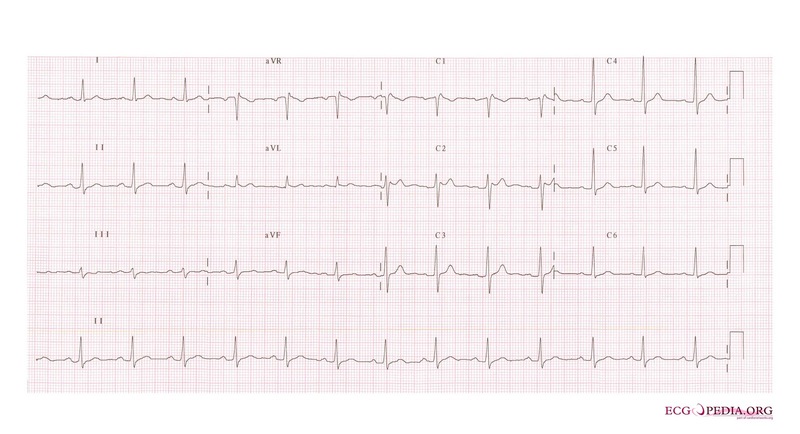 The Study case presented in #ECGclass Case 26 is typical of Brugada syndrome. It is quite likely that this man's father died of undiagnosed Brugada syndrome in his sleep. Brugada syndrome is an inherited channelopathy that results from a sodium ion channel abnormality. Its presents in the 20-50yrs age group, with a prevalence of around 1 in 2000, and is more common in men (8-10 times), especially South Asian men. Can cause sudden cardiac death due to fast polymorphic Ventricular Tachycardia - usually during rest/sleep overnight. For every 10 patients who present with syncope as a result of Brugada syndrome, 8 of them will be diagnosed only after cardiac arrest. The classical ECG changes of Type I Brugada are: ST elevation in V1-V3 and partial RBBB. These ECG changes may be dynamic or 'concealed'. Greater than 2mm ST elevation in V1-3 correlates, with increased arryhtmia risk and ICD is the definitive treatment. So for patients who present with symptoms suggestive of arrhythmia, which are triggered by any of the above, don't forget to think about Brugada. ECG changes of Brugada, can be subdivied into 2 types, but management is the same i.e. consider ICD in high risk individuals. The spectrum of clinical presentation and prognosis in Brugada syndrome can vary enormously. At one end patients may have normal prognosis/no symptoms; through asymptomatic and ECG abnormalities/risks only if exposed to harmful drug triggers; to syncopal episodes/High risk and spontaneously abnormal ECG/spontaneous VF without triggers - certain death. Greater than 2mm ST elevation in V1-V3 correlates with an increased risk of ventricular arrhythmia. Genetic screening/12lead ECG/Ajmaline testing - should be offered to family members. Rare and unusual - but think about it! 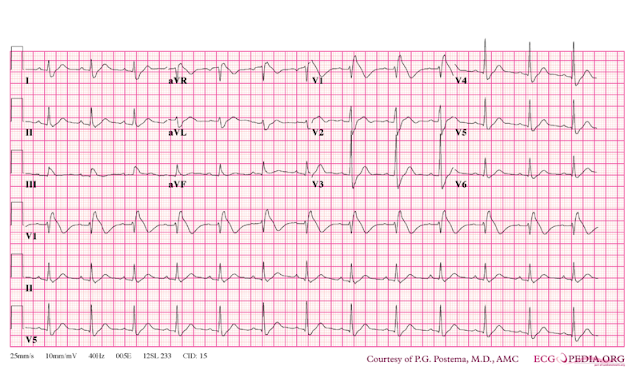 Always consider a possible malignant arrhythmia in unexplained syncope. Think Brugada in an ECG with complete (or incomplete) RBBB and persistent ST elevation in V1-V3. (Sometimes Brugada is misdiagnosed as an acute MI). A 39yrs man, comes to see you in surgery. He's worried about a transient "fainting" episode he had after a couple of glasses of lager, whilst watching the football with friends last Saturday. It was late in the evening and he felt very relaxed when it happened. He denies any excess alcohol intake, in fact he rarely drinks. He doesn't smoke and keeps fit and active. He has always enjoyed good health, with no cardiac history and he denies any chest pain - despite high levels of activity, playing football and squash on a regular basis. Examination is entirely unremarkable, with normal BP and pulse. Q1. Any other questions you might ask? Q2. Are you going to investigate at all? You establish no cardiac family history of note, (for either chest pain or arrhythmia). He can't tell you much about his father as he had died "in his sleep", in India, when your patient was only a small child. No clear diagnosis was ever made but he doesn't think he's ever had heart problems before he died. Q3 Now what? Are you happy with the QT interval? Is there anything else of note?